I wanted to take a few minutes and highlight the 2011 World Junior U-20 Ice Hockey Championships (WJC) which are being played this year in Buffalo, NY from 12/26/10 to 1/5/11. Team USA is the defending goal medal winner. The WJC is one of my favorite hockey events of the entire year. The best young players from around the world representing their countries, all vying for gold. You will see a lot of these players in the NHL someday. Some of the players are USHL alumni, so you may see some familiar names. In fact, seven players on the Team USA roster are USHL alumni. This tournment does not contain any current or former Stars players, but Team USA's Chris Kreider is a former Lincoln Stars draft pick. Click here to read an article I wrote about Kreider in April of '09. Kreider won gold for Team USA last year at the WJC, and is a first round draft pick of the NHL's New York Rangers. Kreider is currently a sophomore at Boston College University. 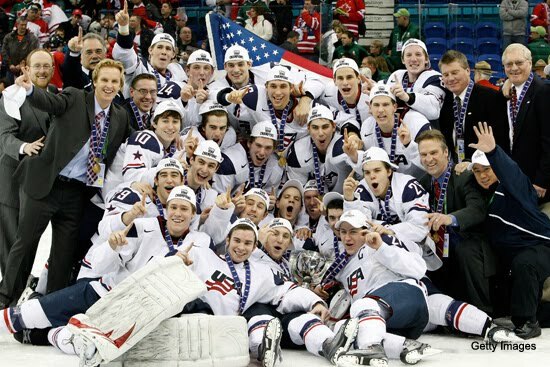 Not only did Kreider win gold last year for Team USA, but Boston College also won the NCAA championships last season. He's considered one of the most talented (and fastest) players on the Team USA Roster. Here are the preliminary round matchups (dates and times) for Team USA. All times listed below are EST. If you're lucky enough to have the NHL Network, you will be able to watch all of the Team USA WJC games, and many others. Click here to view a full TV broadcast schedule of all games. I printed out the TV schedule, and highlighted all the Team USA games, and other matchups I want to watch. But I'm a hockey nerd like that. Anyway, if you get the opportunity to watch any of these games, please check them out. I know you won't be disappointed. I love this tournament too. I actually like it more than the Olympics anymore. It was especially great last year with Dean Blais coaching. He held an autograph session with that team photo before a Mavs game when he got back, and you could tell how much that medal meant to him. Omaha actually put in a bid to host this year's tournament but lost out in the end. That would be so much fun to watch these games in person, especially if it comes down to the U.S. and Canada again. There will be a lot of Canadians in Buffalo for sure. Great hockey.